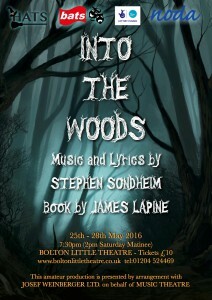 Horwich Amateur Theatre Society presents Stephen Sondheim’s musical smash hit “Into the Woods”. Fairytales collide in the darkness and light of the Wood. Red Riding Hood meets her Wolf whilst Cinderella wonders whether she really wants to go the ball and the Baker and his Wife desperately seek a resolution to their curse. Witches are right, Princes aren’t that charming, Giants can be kind and Rapunzel loses her hair…..in short every story flips on its head until we understand only that nothing is ever what it seems. 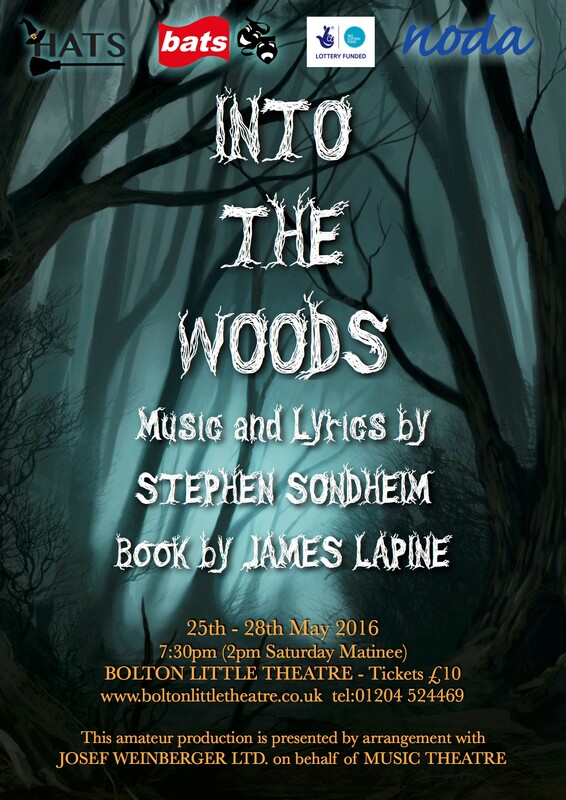 Performances start 7.30 at Bolton Little Theatre Hanover Street Wed 25th – Sat 28th May 2016, except Saturday matinee which starts at 2pm. Wheelchair space available (please book through the theatre Box Office). Tickets are priced at £10 and you can book online at http://www.boltonlittletheatre.co.uk/ or at Bolton Little Theatre box office in person or by telephone on Monday night from 7.30 to 9pm and Friday mornings from 10.30 to 12 noon – no extra charge if paying by cash or cheque and you can book during BLT’s run of the plays.